It’s a covered patio and it is absolutely unforgettable. 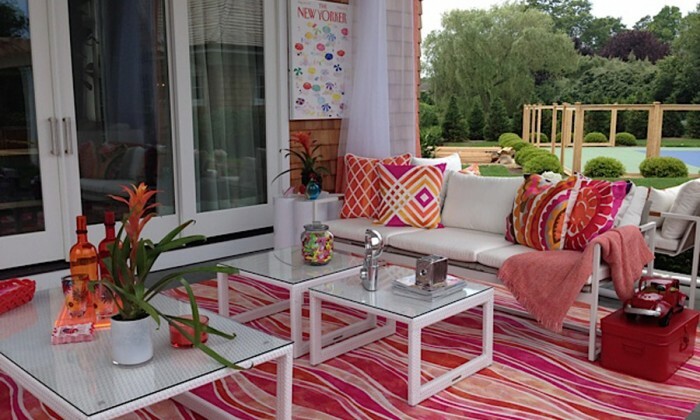 Pink and orange, anchored in white and complete with dramatic drapes and a bar. 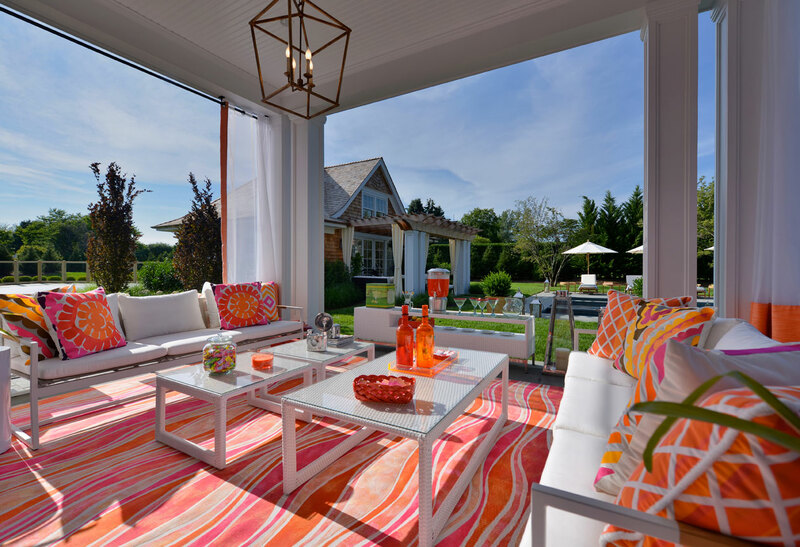 “Talk about happy hour, this is the spot,” said Gail Tarasoff of Anne Tarasoff Interiors, who designed the head-turning patio for a showhouse at Hampton Designer Showhouse in Bridgehampton. Who needs a crowded bar when you can invite friends over to such a bright-and-sunny spot in your own backyard to unwind on Friday afternoon? 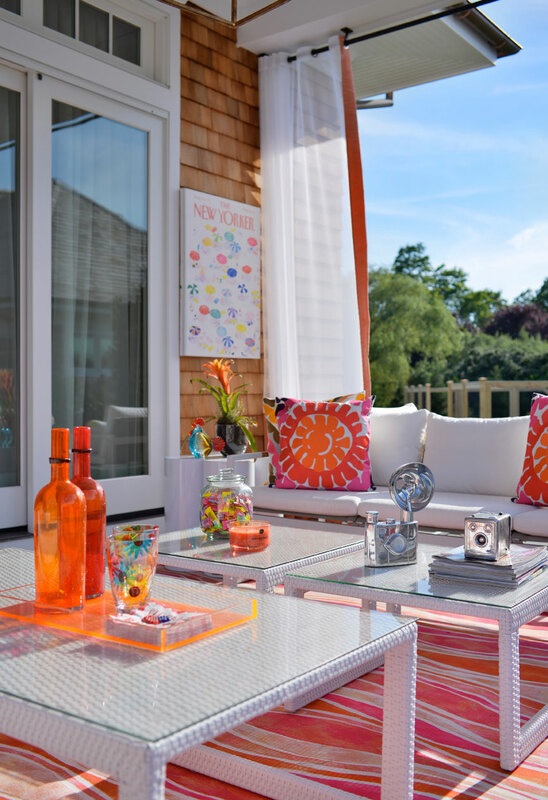 Summer is all about bringing the indoors outdoors, and Tarasoff shared her tips on how to do just that by using two of the happiest colors ever. The colors, the decor, the bar, they all scream one thing: fun. 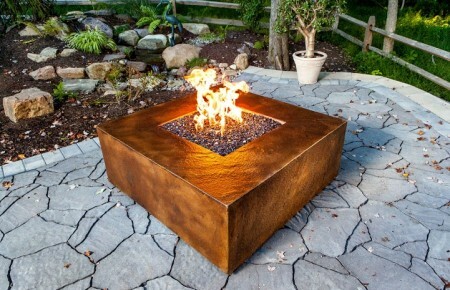 Take a step back, though, and make sure you’re thinking practically when you pick out items for an outdoor space. All of the furnishings here are weather-protected, even the pillows, drapery and sheer panels. “If it’s outdoors, as all of this was, you have to use things that are meant for outdoors or it will get ruined,” Tarasoff warned. This means steering clear of things that are metal, which will eventually rust after some obligatory summer showers. Tarasoff recommends FrontGate, where she got all the furnishings for the patio. She admits that some of the decor, like the lucite tray and bottles, aren’t really made for outdoors, but they’re small and easy to move. “Anything not made for outdoors comes in,” she said. Okay, now for the fun part: choosing a color scheme. Tarasoff didn’t go shopping with a definite one in mind. Then she laid eyes on the perfect rug. “With this room, the first thing that I fell in love with was the area rug,” Tarasoff said. “I was looking through FrontGate and I saw the rug and I said, ‘That’s it. That’s the room. '” Once you’ve chosen your bright-and-happy colors, go to town and stock up on items that go with it, like pillows, bottles, barware, baskets and candles. “Anytime I went anywhere and saw anything in hot pink or orange, I grabbed it,” Tarasoff laughed. The extras take a room like this from pretty-and-functional to fun. Margarita glasses and an orange-and-silver beverage dispenser that are great for your famous sangria and punch line a long, low table. “That’s a bar, that’s happy hour,” Tarasoff said. “It’s the perfect little serving area.” Having some coffee table books and magazines for guests to leaf through, cocktail in hand, creates a relaxing vibe. During the summer months, parties are in the afternoons and people love to bring their kids, so make a favorite backyard hangout for the little ones by keeping a candy jar stocked. “I wanted to make it suitable for everyone,” Tarasoff said. “When the kids are out there, they have the candy. When the adults are out there, they have the punch.” Of course, the adults will love the candy, too.